Stellar Four: Calling All Writers: Why Aren't You Using Scrivener Yet? 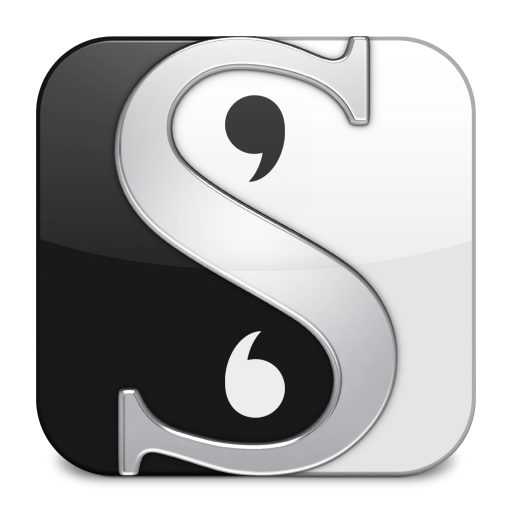 Calling All Writers: Why Aren't You Using Scrivener Yet? Don't you love it when something is as good as promised? Following a monthlong trial, I've determined that the writing software Scrivener is, in fact, the game-changing, writer-friendly wonder program it was rumored to be. As I told you all at the beginning of November, I took advantage of Scrivener's free trial during National Novel Writing Month and used it to knock out my 50,000 words. I was skeptical at first, in large part because before I could type a word, I had to walk through a lengthy, head-spinning tutorial demonstrating all of the program's bells and whistles. It was daunting, and I thought at the time, "I will never use all of this stuff. I should just stick with Word." I was both right and wrong. After a month of use, I haven't tapped into even a fraction of what this program can do. But lemme tell ya, what I have figure out how to use has been so incredibly useful that I took advantage of Scrivener's promotion for NaNoWriMo winners and bought the program for 50 percent off. And now I'm going to convince all of the writers out there why you should pony up the $45 ($5 less for PCs) for the program, even without a discount code: Scrivener is an organizational dream. 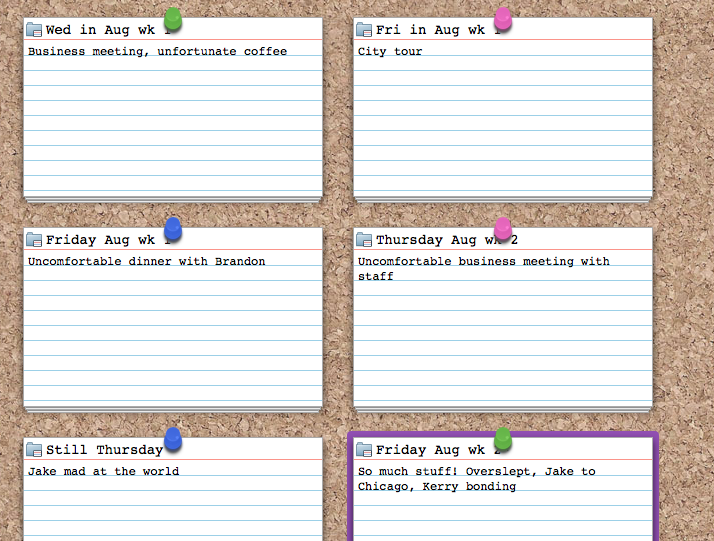 The program lets you write in chunks and organize your work into folders. Your folders can be chapters, characters, plot threads, whatever you choose. You can name them what you want, drag and drop them where they need to go, and easily search them. Last year during NaNoWriMo, I discovered how hard it is for me to keep track of timelines and when things happen in the story. I solved that problem this year by making each folder roughly a chapter, but labeling those chapters with the time period they cover. This worked for me, but it's so flexible that you can customize it for your own labeling needs. Searching is easier, too. In the past when wanting to refer back to a previous reference on longer documents, I had to Command-F and hope I remembered the proper word combination for whatever I needed. Here, I can generally locate it more quickly because the story's broken into labeled, bite-sized pieces. And there's a search function, too, of course. The bottom of the lefthand bar also has folders you can create for your characters so you can compile their first and last names, eye color, height, alma mater, mom's nationality, whatever. It's a lifesaver as a quick reference for supporting characters, especially. (Lemme tell ya, this is something George R.R. Martin could really use. I saw him speak a few years ago, and I asked him how he keeps track of things like character eye color, and he said he really doesn't and always has to look it up, which is part of the reasons he writes so slowly. Try this program, George! You heard it here first!) That same area also has a spot for you to save research, articles, reference documents and so forth so you don't have to open a new program or break your stride if you're on a roll. Oh, and it automatically saves a backup when you close out of the program. 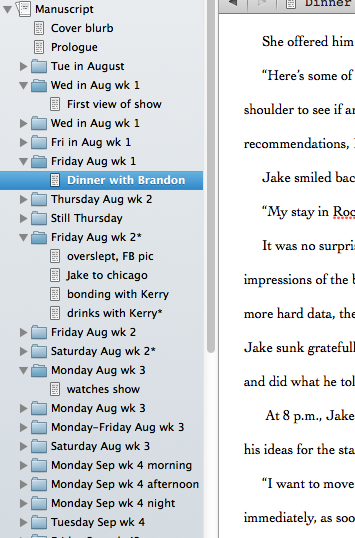 Scrivener's potential is hugely exciting for other types of writing, too. I'm an academic, and I conduct research, write scholarly articles on the results, and submit them for publication. What could I do with separate folders for the literature review, methods, results, discussion, and conclusion, plus a place to stick citation articles and charts and graphs for easy referral? I'm giddy with the possibilities! In addition, my husband's an attorney, and Scrivener will be an enormous help when he writes appellate briefs, again because of the ease of storing research, chunking your work, focusing on one element at a time, searching for what you've already done, and reorganizing when necessary. Long story short: If you're a writer of lengthier projects, Scrivener is worth it. Absolutely, without a doubt worth it. If you want to give it a spin yourself, you can download it for a 30-day trial. That's probably all it will take to convince you to buy it for keeps. Now if you'll excuse me, I need to boot up my copy of Scrivener. I'm still tweaking my book.